The famous long line outside DO. For months, New Yorkers have been inquiring about DŌ, the popular dessert themed shop’s kosher status, and we finally have a clear answer: they are now kosher. 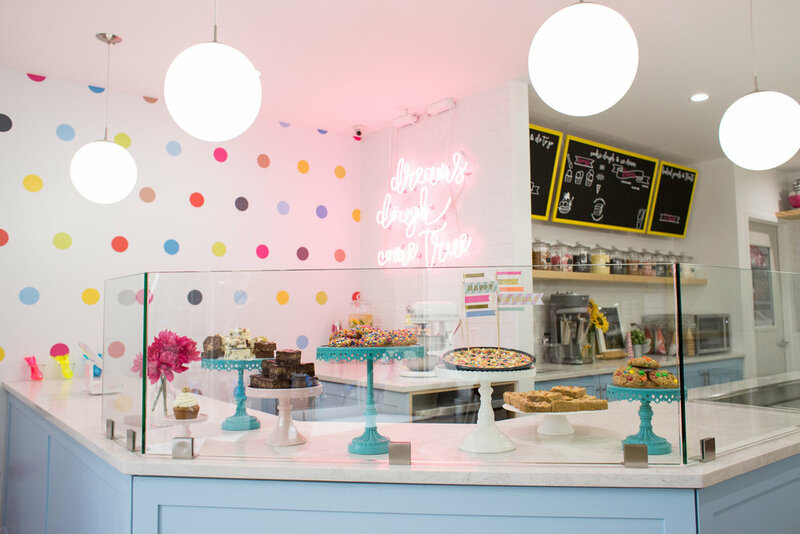 DŌ, pronounced “dough”, is a small shop specializing in Cookie Dough desserts located in Greenwich Village, south of Washington Square Park & NYU. 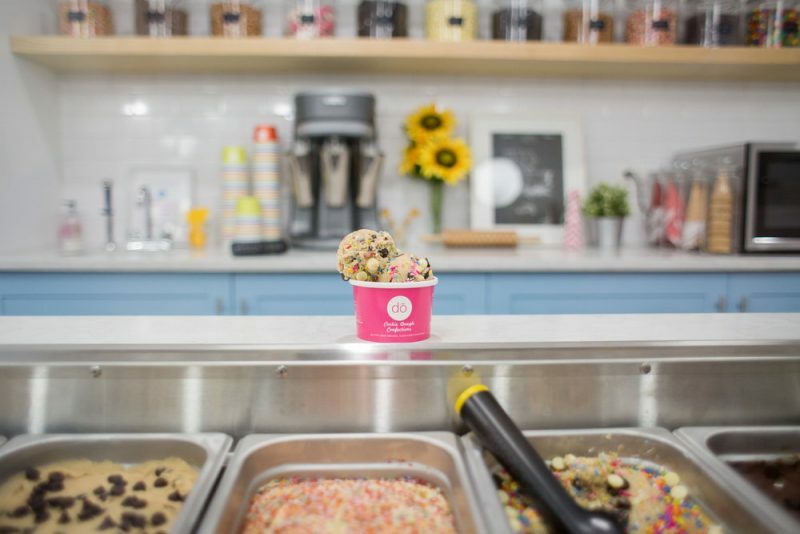 The store’s menu items include: Cookie Dough served by the scoop, cookie dough infused ice cream, milkshakes, cookies, brownies, cakes, and other pastries. 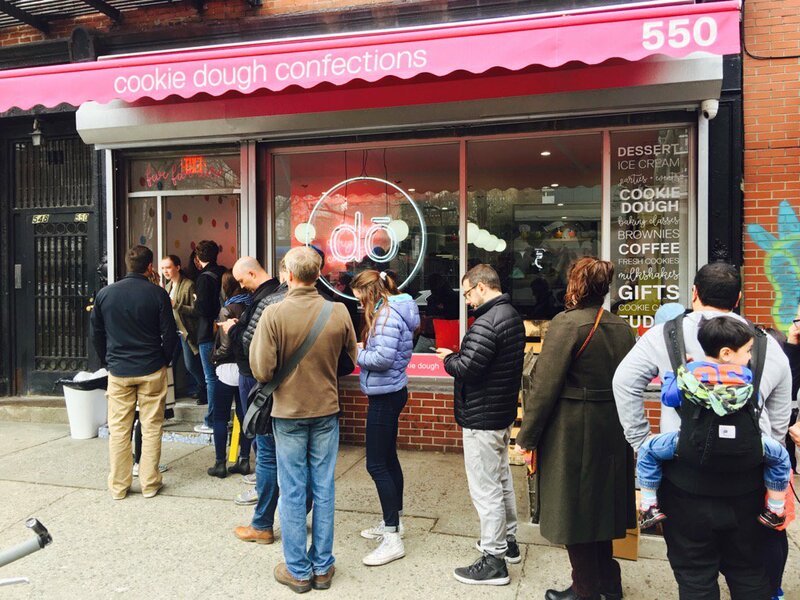 DŌ lists its cookie dough flavors here. There is a 4 item limit per person for scooped items (see below as to why). Our line typically starts forming in advance of opening. We open at 10 am. Expect to stand in line for 30 minutes – 3 hours, depending on the day/time. To avoid the line, the best time to come is before noon on Tuesdays, Wednesdays and Thursdays. Expect longer lines on weekends, holidays and when it’s nice weather. The line forms across the street (yes, on the Northeast corner of Laguardia and W. 3rd Street). We do this out of respect for the neighboring businesses and residences. The line is SINGLE FILE – so that pedestrians can still use the sidewalk. Unfortunately we are unable to tell you the current status of the line, as it is always changing. You will get a ticket in the front of the line, which will be collected at the door. You will not be served unless you have a ticket. The only way to get a ticket, unfortunately, is to stand in line. The color of the ticket changes daily, so it is in your best interest not to purchase tickets of any kind. FOR CLOSING, WE TYPICALLY CUT OFF THE LINE PRIOR TO CLOSING SO WE ARE ABLE TO GET THROUGH THE LINE. WE RECOMMEND GETTING IN LINE WELL IN ADVANCE OF CLOSING TIME. Unfortunately, if you are not inside our doors by closing time, we cannot serve you. Sorry! We recommend getting in line early, to ensure the largest selection of items. We are a bakery, making fresh cookie dough creations daily. Flavors are subject to availability. Kosher supervision is under Rabbi Mehlman (NKS). Products are not Cholov Yisroel or Pas Yisroel. There’s a mix of dairy and pareve items, detailed on the hashgacha certificate. NOTE: All varieties of cones are NOT KOSHER. Hours of operation: Monday: CLOSED, Tuesday, Wednesday: 10 am – 9 pm, Thursday, Friday, Saturday: 10 am – 10 pm, Sunday: 10 am – 9 pm. The restaurant notes that they frequently sell out and thus close early for the day. They recommend checking their social channels for updates. Images by Twitter user Plattypants and DO.